In the early 19th century, the area near an ancient burial site was known as Pohukaina. It is believed to be the name of a chief (sometimes spelled Pahukaina) who according to legend chose a cave in Kanehoalani in the Koʻolau Range for his resting place. The land belonged to Kekauluohi, who later ruled as Kuhina Nui, as part of her birthright. She lived there with her husband Charles Kanaina. Kekūanāoʻa also had his home just west of Kekauluohi called Haliimaile and Keoni Ana lived in Kīnaʻu Hale (which was later converted into the residence of the royal chamberlain), all members of the House of Kamehameha. This area was a sacred burial site for the aliʻi (ruling class). Kekāuluohi and Kanaʻina's original home was similar to that of the other estates in the neighborhood consisting of small buildings used for different purposes. The sitting and sleeping area had a folding door entrance of green painted wood under glass upper panels. The house had two rooms separated by a festooned tent door of chintz fabric and was carpeted with hand crafted makaloa mats. In the front was a lounge area opposite a sideboard and mirror. In the middle they placed a semi circle of armchairs with a center table where the couple would write. Four matching cabinet-bookshelves with glass doors were set in each corner of the room with silk scarves hanging from each. In his book, A visit to the South Seas, in the U.S. Ship Vincennes: during the years 1829 and 1830, Charles Samuel Stewart describes the area and homes in detail. Next to their home was an old estate that had been demolished called Hanailoia. This was the spot oral history told of an ancient heiau (temple to the Hawaiian religion) called Kaʻahaimauli that was destroyed here. In July 1844 Kekūanāoʻa began building a large home here as a gift to his daughter Victoria Kamāmalu. Instead, Kamehameha III would buy the estate and use as his Royal Residence after moving the capitol of the kingdom to Honolulu. It would become the Iolani Palace. As older aliʻi died, the lands were passed down and concentrated into fewer hands. Kekāuluohi's lands were passed down to her from the Kamehameha family. When she died, she left her accumulated lands and wealth to her son, not her husband Kanaʻina however, Lunalilo predeceased his father. After 1825, the first Western-style royal tomb was constructed for the bodies of King Kamehameha II and his queen Kamāmalu. They were buried on August 23, 1825. The idea was heavily influenced by the tombs at Westminster Abbey during Kamehameha II's trip to London. The mausoleum was a small house made of coral blocks with a thatched roof. It had no windows, and it was the duty of two chiefs to guard the iron-locked koa door day and night. No one was allowed to enter the vault except for burials or Memorial Day, a Hawaiian holiday celebrated on December 30. Over time, as more bodies were added, the small vault became crowded, so other chiefs and retainers were buried in unmarked graves nearby. In 1865 a selected 20 coffins were removed to the Royal Mausoleum of Hawaii called Mauna ʻAla in Nuʻuanu Valley. But many chiefs remain on the site including: Keaweʻīkekahialiʻiokamoku, Kalaniopuu, Chiefess Kapiolani, and Timothy Haalilio. After being overgrown for many years, the Hawaiian Historical Society passed a resolution in 1930 requesting Governor Lawrence Judd to memorialize the site with the construction of a metal fence enclosure and a plaque. Tradition holds that the tomb was on the site of a former cave. The home built by Kekūanāoʻa was a wood and stone building called Hale Aliʻi meaning (House of the Chiefs). It had only one-third the floor space of the present palace. Mataio Kekūanāoʻa, who was long-time Royal Governor of Oʻahu and husband of Kīnaʻu, the daughter of Kamehameha I. He built the large home for his daughter Princess Victoria Kamāmalu who, from birth, was expected to rule in some capacity. It was purchased by King Kamehameha III from Kamāmalu (the King's niece) when he moved his capital from Lahaina to Honolulu in 1845. It was constructed as a traditional aliʻi residence with only ceremonial spaces, no sleeping rooms. It just had a throne room, a reception room, and a state dining room, with other houses around for sleeping and for retainers. Kamehameha III slept in a cooler grass hut around the palace. He called his home Hoʻihoʻikea, a separate building flanking the palace on the west side in honor of his restoration after the Paulet Affair of 1843. Kamehameha IV build a separate house on the east side of the palace called Ihikapukalani (on the mauka side) and Kauluhinano (on the makai side). During Kamehameha V's reign Hale Aliʻi's name was changed to ʻIolani Palace, after his brother Kamehameha IV's given names (his full name was Alexander Liholiho Keawenui ʻIolani). It refers to the ʻIo (royal hawk). The Palace served as the official residence of the monarch during the reigns of Kamehameha III, Kamehameha IV, Kamehameha V, Lunalilo, and the first part of Kalākaua's reign. The original structure was very simple in design and was more of a stately home than a palace, but at the time, it was the grandest house in town. The palace was largely meant for receiving foreign dignitaries and state functions with the monarch preferring to sleep in private homes. Kamehameha I formed his official government at Lahaina, Maui in 1802, where he built the kingdom's first royal residence called the Brick Palace. The Lahaina palace remained the seat of government under the first three Kamehameha monarchs until 1845 when Kamehameha III moved the royal court. Lahaina had been the seat of government, where the royal courts of many chiefs of Maui had been located, including Kahekili II until 1794. In 1845 Kamehameha III moved the Royal Court and capitol to Honolulu. Hale Ali'i would become the seat of government and would remain so through the subsequent Kamehameha monarchs. After 1874, the main seat of government was transferred to the new central government building left by Kamehameha V. After the overthrow the provisional government would use the Iolani Palace as the seat of government. While a territory, the palace was called: The Capitol of the Territorial Government. It would also serve as the first state capitol building. The area was culturally significant as a seat of government for many reasons including the palaces size, orientation and other factors of religious importance and bridged the ancient history of Hawaii with the new 19th century monarchy. Three architects, Thomas J. Baker, Charles J. Wall, and Isaac Moore, contributed to the design; of these, Baker designed the structure, while Wall and Moore offered other details. The cornerstone was laid December 31, 1879 during the administration of Minister of the Interior Samuel Gardner Wilder. :204 It was built of brick with concrete facing. The building was completed in November 1882 and cost over $340,000 — a vast fortune at the time. It measures about 140 feet (43 m) by 100 feet (30 m), and rises two stories over a raised basement to 54 feet (16 m) high. It has four corner towers and two in the center rising to 76 feet (23 m). On February 12, 1883 a formal European-style coronation ceremony was held, even though Kalākaua had reigned for 9 years. The coronation pavilion officially known as Keliiponi Hale was later moved to the southwest corner of the grounds and converted to a bandstand for the Royal Hawaiian Band. It served as the official residence of the Hawaiian monarch until the 1893 overthrow of the Kingdom of Hawaii. Therein not only Liliʻuokalani, but, Queen Kapiʻolani and other royal retainers were evicted from the palace after the overthrow. The palace is the only official state residence of royalty on U.S. soil. Upon the overthrow of the monarchy by the Committee of Safety in 1893, troops of the newly formed Provisional Government of Hawaiʻi took control of ʻIolani Palace. After a few months government offices moved in and it was renamed the "Executive Building" for the Republic of Hawaiʻi. Government officials carefully inventoried its contents and sold at public auctions whatever furniture or furnishings were not suitable for government operations. 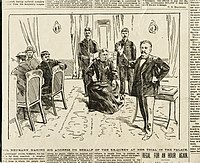 Queen Liliʻuokalani was imprisoned for nine months in a small room on the upper floor after the second of the Wilcox rebellions in 1895. The quilt she made is still there. The trial was held in the former throne room. When a proposed annexation treaty up for ratification, the Hawaiian Patriotic League held a protest rally at the palace on September 6, 1897. They gathered petition signatures in an effort to demonstrate the treaty did not have popular support. On August 12, 1898 U.S. troops from the USS Philadelphia came ashore and raised the Flag of the United States at the palace to mark the annexation by the Newlands Resolution. The Queen and other Hawaiian nobles did not attend, staying at Washington Place instead. The building served as the capitol of the Territory of Hawaiʻi, the military headquarters during World War II, and the State of Hawaiʻi. During the government use of the palace, the second floor royal bedroom became the governor's office, while the legislature occupied the entire first floor. The representatives met in the former throne room and the senate in the former dining room. When Liliuokalani died in 1917, territorial governor Lucius E. Pinkham accorded her the honor of a state funeral in the throne room of the palace. After annexation, there was a fear that all records would be moved to the mainland. Since an 1847 effort by Robert Crichton Wyllie, a set of archives had been kept of all kingdom records. A new fireproof building was built in 1906 on the grounds just to the southeast of the palace. It included a vault 30 feet (9.1 m) by 40 feet (12 m) with steel shelves. At first it was to be called the Hall of Records, but the name Archives of Hawaii made it clear the documents included those from the kingdom. A new Kekāuluohi building provides digital access to some of the collections. In 1930 the interior of ʻIolani Palace was remodeled, and wood framing replaced by steel and reinforced concrete. The name ʻIolani Palace was officially restored in 1935. During World War II, it served as the temporary headquarters for the military governor in charge of martial law in the Hawaiian Islands. The Hawaiian soldiers of Japanese ancestry who were accepted for service in the U.S. Army became the core of the 442nd Infantry Regiment. Before leaving Hawaii for training on the mainland, they were sworn in during a mass ceremony on the grounds of the Palace. Through more than 70 years as a functional but neglected government building, the Palace fell into disrepair. After Hawaii became a state, Governor John A. Burns began an effort to restore the palace in the 1960s. The first step was to move the former ʻIolani Barracks building from its original position northeast of the palace. It now serves as a visitors center for the palace. Through the efforts of acquisitions researchers and professional museum staff, and donations of individuals, many original Palace objects have been returned. Government grants and private donations funded reproduction of original fabrics and finishes to restore Palace rooms to their monarchy era appearance. ʻIolani Palace opened to the public in 1978 after structural restoration of the building was completed. In the basement is a photographic display of the Palace, orders and decorations given by the monarchs, and an exhibit outlining restoration efforts. On January 17, 1993, a massive observation was held on the grounds of ʻIolani Palace to mark the 100th anniversary of the overthrow of the Hawaiian monarchy. A torchlight vigil was held at night, with the palace draped in black. On April 30, 2008, ʻIolani Palace was overtaken by a group of native Hawaiians who called themselves the Hawaiian Kingdom Government to protest what they view as illegitimate rule by the United States. Mahealani Kahau, "head of state" of the group, said they do not recognize Hawaiʻi as a U.S. state, but would keep the occupation of the palace peaceful. "The Hawaiian Kingdom Government is here and it doesn't plan to leave. This is a continuity of the Hawaiian Kingdom of 1892 to today," Kahau said. Friends of ʻIolani Palace released a statement stating: "We respect the freedom of Hawaiian groups to hold an opinion on the overthrow of the Hawaiian Kingdom, we believe that blocking public access to Iolani Palace is wrong and certainly detrimental to our mission to share the Palace and its history with our residents, our keiki (children), and our visitors." An exterior view of the Palace was frequently shown on the TV show Hawaii Five-O, suggesting it hosted the offices of the fictional state police unit featured on the show. A movie titled Princess Kaiulani about Princess Victoria Kaʻiulani Cleghorn was filmed at the palace in 2008. ^ Staton, Ron. "Oahu: The Iolani, America's only royal palace". Seattle Times. Retrieved 3 March 2016. ^ Papers of the Hawaiian Historical Society. Bulletin Publishing Company. 1930. p. 34. ^ a b All about Hawaii: The Recognized Book of Authentic Information on Hawaii, Combined with Thrum's Hawaiian Annual and Standard Guide. Honolulu Star-Bulletin. 1904. pp. 75–76. ^ a b Charles Samuel Stewart (1831). A visit to the South Seas, in the U.S. Ship Vincennes: during the years 1829 and 1830; with scenes in Brazil, Peru, Manila, the Cape of Good Hope, and St. Helena. J.P. Haven. pp. 137–. ^ "Hawaii Alive |". Hawaiialive.org. Retrieved May 8, 2013. ^ Jim Bartels (2003). "Pohukaina". Pacific Worlds web site. Retrieved 2010-04-07. ^ a b Bartels, Jim. "ʻIolani Palace". Pacific World. Retrieved 2010-04-07. ^ Judd 1975, p. 67. ^ Kamehiro 2009, p. 61. ^ a b c d e f Ben Levy (December 1985). "Iolani palace nomination form". National Register of Historic Places. U.S. National Park Service. Retrieved 2010-04-06. ^ Trudy Ring; Noelle Watson; Paul Schellinger (5 November 2013). The Americas: International Dictionary of Historic Places. Routledge. p. 315. ISBN 978-1-134-25930-4. ^ John R. K. Clark (January 1989). The Beaches of Maui County. University of Hawaii Press. p. 57. ISBN 978-0-8248-1246-1. ^ Bonnie Friedman (1 April 2011). DK Eyewitness Travel Guide: Hawaii. DK Publishing. p. 43. ISBN 978-1-4053-6742-4. ^ Fodor's (1993). Hawaii '94: The Complete Guide with Scenic Drives and Adventures Off the Beaten Path. Fodor's Travel Publications. p. 41. ISBN 978-0-679-02519-1. ^ Gladys L. Knight (11 August 2014). Pop Culture Places: An Encyclopedia of Places in American Popular Culture [3 volumes]. ABC-CLIO. pp. 433–434. ISBN 978-0-313-39883-4. ^ Mrinalini Rajagopalan; Madhuri Shrikant Desai (2012). Colonial Frames, Nationalist Histories: Imperial Legacies, Architecture and Modernity. Ashgate Publishing, Ltd. p. 172. ISBN 978-0-7546-7880-9. ^ "'Iolani Palace". National Park Service. Retrieved 8 September 2018. ^ Ralph Simpson Kuykendall (1967). Hawaiian Kingdom 1874-1893, the Kalakaua Dynasty. 3. University of Hawaii Press. ISBN 978-0-87022-433-1. ^ Jessica Lane Lucier; Evelyn Z. Hsieh (25 November 2008). Let's Go Hawaii 5th Edition. St. Martin's Press. p. 117. ISBN 978-0-312-38579-8. ^ Mike Gordon (July 2, 2006). "Annexation". Honolulu Advertiser. Retrieved 2010-04-30. ^ "Funeral is Held in the Throne Room". The Hawaiian Gazette. X (93). Honolulu. November 20, 1917. p. 3. Retrieved February 4, 2017. ^ Robert C. Lydecker (June 9, 1906). "The Archives of Hawaii". Papers of the Hawaiian Historical Society Number 13. Hawaiian Historical Society, Honolulu. pp. 5–23. ^ "Hawai'i State Archives". official web site. Retrieved 2010-04-08. ^ Coffman, Tom et al. (2006). The First Battle: the Battle for Equality in War-time Hawaii, Script, Act II. ^ "Iolani Palace". National Historic Landmark summary listing. National Park Service. Archived from the original on 2009-08-28. Retrieved 2008-06-21. ^ a b "Restoration of the Palace". official web site. Friends of ʻIolani Palace. Archived from the original on 2010-05-03. Retrieved 2010-04-06. ^ Burl Burlingame (April 3, 2008). "The only royal residence in the U.S. celebrates the lost Hawaiian monarchy". Honolulu Star-Bulletin. Retrieved 2010-04-07. ^ Pat Pitzer (May 1994). "The Overthrow of the Monarchy: Winds of profound change swept over Hawai`i in the 1890s, turbulent times that altered the islands' future forever". Spirit of Aloha. Aloha Airlines. Retrieved 2010-04-07. ^ Newton-Matza 2016, p. 286. ^ "Native Hawaiians blockade historic palace". CNN. May 1, 2008. Retrieved 2010-04-08. ^ "Protesters Occupy Hawaiian Palace In Peace: The Hawaiian Kingdom Government Group Does Not Recognize The Islands As A U.S. State". CBS News. April 30, 2008. Retrieved 2010-04-08. ^ "Native Group Occupies Grounds of Palace". The New York Times. May 1, 2008. Retrieved April 2, 2010. ^ Richard Borreca (March 25, 2008). "Senators seek overthrow of 'Princess' film tax help". Honolulu Star-Bulletin. Retrieved 2010-03-26. ^ Katherine Nichols and Gary Chun (October 16, 2009). ""Princess" sparks heated debate". Honolulu Star-Bulletin. Retrieved 2010-03-26. Kamehiro, Stacy L. (2009). The Arts of Kingship: Hawaiian Art and National Culture of the Kal?kaua Era. University of Hawaii Press. ISBN 978-0-8248-3263-6. Newton-Matza, =Mitchell (6 September 2016). Historic Sites and Landmarks that Shaped America: From Acoma Pueblo to Ground Zero [2 volumes]: From Acoma Pueblo to Ground Zero. ABC-CLIO. ISBN 978-1-61069-750-7. Judd, Walter F. (1975). Palaces and Forts of the Hawaiian Kingdom: From Thatch to American Florentine. Honolulu: Pacific Books, Publishers. ISBN 978-0-87015-216-0. Wikimedia Commons has media related to Iolani Palace.